At the center of this exploration of faith is Michal (Noa Koler), a devout Orthodox Jew in her mid-thirties with an urgent desire to be married. 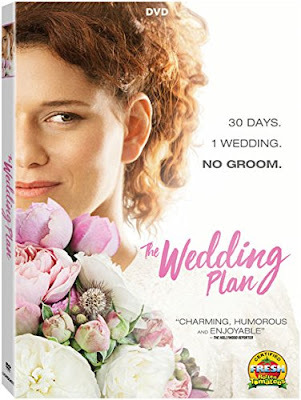 The struggles of single life seem to be ending for Michal, until her fiancé calls off the engagement a month before the wedding. Unwilling to alter her course, Michal puts her faith in God to provide her a new groom before the month is up. Continuing to plan for the ceremony without a man, Michal seeks out new prospects through a matchmaker. While this unconventional approach and some of the unique prospects that she meets provide humor for the film, the laughs are never at the expense of Michal or her leap of faith. This allows a certain sincerity to penetrate the film, guided by director Rama Burshtein’s carefully balanced tone and Koler’s dedicated performance. Although the film is a precise balance between earnestness and humor found in the absurdity of the scenario, Burshtein’s screenplay lacks the same focus. Koler is endlessly believable and engaging, but the film sends her down a repetitious path that feels needlessly cruel at times. It isn’t the pain of the endless disappointments necessarily, but more the feeling that some of the situations are contrived just to test the protagonist. Even this could be justified as essential to achieve the catharsis of the final resolution, but too many of the sequences of pain just feel redundant. Watching Michal go on multiple dates is far from dull, because each man she interviews to be her husband has a distinct personality, and each reaction to her goal is different, while the multiple scenes of Michal explaining her reasoning to family and friends often feels like the same conversation repeating itself. The conversations about Michal’s certainty may dominate portions of the film, but the strength in the screenplay comes from her moments of doubt. It is not just doubt that her plan will work, but a larger questioning about her own faith and what it means that she lacks confidence in the plan she believes that God has for her life. Like pulling at a loose thread, the questioning of this one act of faith leads to the unraveling of all that Michal holds dear. This is a subject and theme that is relatable to far more than those waiting on a spouse; it can apply to any aspect of life where there is uncertainty and hope. The deeper themes are what elevate this film above the typical romantic comedy tropes, but this is only possible due to Koler’s sincere performance. As intriguing as the other characters in the film are, she remains the emotional center for audiences to relate to. Often appearing irrational and emotionally unstable, Michal represents the flawed but hopeful humanity in all of us. We root for her, despite the unlikely situation she is hoping for, because it is impossible not to see a bit of ourselves in her contradictions. The DVD release comes with a photo gallery as the only special feature.